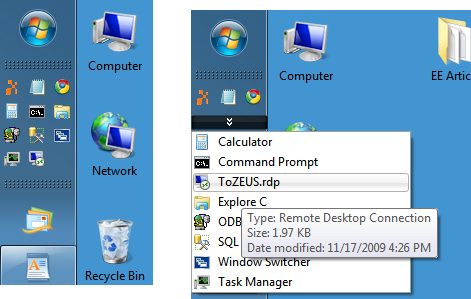 Coming to Win7 from XP, you might wonder where the QuickLaunch toolbar went. This article describes how to get back that "QuickLaunch" functionality. First, be aware of the Win7 idea of pinning programs to the Taskbar; that feature provides some important new capabilities. For instance, you can right-click a pinned item and see (and then open) documents that you have opened/edited recently with that pinned program. That's a handy feature and a big time saver. But the familiar old XP QuickLaunch bar has always been a great place to park a pile of programs and documents, from often-accessed folders to seldom-used (but hard to locate) tools to ultra-favorite website links -- basically anything that you might want to Launch Quickly, with one click and no hassle. It turns out that Win7 has this capability, but it's not a separate item -- it's just a customization of the built-in Windows Explorer support for user-defined Explorer toolbars. Create a folder for your QuickLaunch tools. Populate the folder with a starter set of tools. 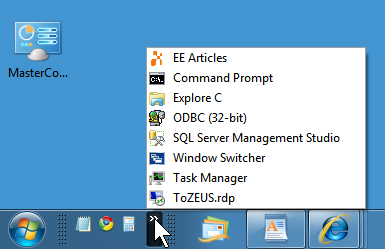 Drag a few items from the desktop into your QuickLaunch folder and/or right-click and choose New Shortcut. For instance, I created shortcuts to Notepad.Exe, Calc.Exe, and Google Chrome. (or whatever location you chose for saving the tool folder). Click OK. The new toolbar appears on the right-hand side, next to the notification area. Set the Properties to match the familiar "QuickLaunch look." Drag the new toolbar to the accustomed position. This is the only tricky bit... At least to me, it seemed like I had hopelessly screwed things up. As you drag the toolbar, the rest of the taskbar scrambles around wildly, but have courage! When you get to the "Windows Marble," release the mouse button. The QuickLaunch toolbar will stay positioned right there. Now just grab the drag handle of the main ("running programs") part of the task bar and move it toward the left, leaving the desired amount of room for your QuickLaunch toolbar. Reposition the tool icons: Just drag and release. Put things where you can find them easily. Give yourself a good Tooltip. Right-click and select Rename. Since all you have is a naked icon, this is the only place you can label things. A good tooltip is especially important for folder icons and Internet shortcuts. Access the folder: Right-click the drag handle and choose Open Folder. This simplifies operations such as adding a series of new shortcuts or other maintenance operations. This is very convenient. You can put your most-often accessed items in the visible portion for one-click access and the rest will still be available with just two clicks -- all while using a minimum of taskbar space. Turn the entire Taskbar on its edge. You can set the Taskbar to be on the left side of the screen rather than the bottom. This just makes good sense: With wide-screen monitors, there is plenty of screen-width to spare, but vertical space is still a precious commodity. Just right-click on the taskbar, select Properties and set Taskbar location on screen to Left (or just click on an empty part of the taskbar and drag it to the left). It may take a while to get used to this layout, but I recommend that you give it a try. There are a number of small advantages that you may come to appreciate.